Compatible with high resolution and high speed. Newly developed high-speed print head. A newly developed high-speed print head containing 180 nozzles x 8 lines, allows for ease of assembly and calibration. With it's increased print head accuracy the JV33 delivers truly high quality print of 1,440 dpi. In addition, the improved running efficiency has improved the print speed by 30% over the JV3 series. Print quality in 4-color bidirectional mode is also improved using a "symmetric ink arrangement"
Precise control of ink firing reproduces details of photo image at a maximum resolution of 1,440 dpi. Even edges of 4-point text are printed sharp and clear. By producing dots in three different sizes, smooth high resolution graphics are created without a grainy appearance. Even at high speed and in low resolution mode high quality printing is possible. A triple stage intelligent heater automatically heats up the media to the appropriate temperature, thus improving the performance of ink. A newly mounted Post-heater quickens drying time and thus enables a fast take-up of the media. UISS for continuous printing is standard on JV33 machines. The JV33 can utilize two cartridges per color in 4-color mode. When the ink cartridge runs out, another cartridge begins supplying ink and helps prevent running out of ink. A maximum of 880cc ink per color can be loaded at one time. With 880cc of ink loaded at one time, a 50m (54yd) roll of media can be printed without interruption. Ink cartridges can be changed during printing. *UISS can not be used in 6-color mode. 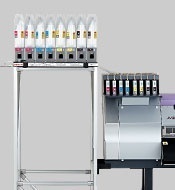 The bulk ink system using ink packs of aluminum achieves as stable and reliable ink ejection as printing solely with cartridges. It is possible to use both 2-liter ink packs in combination with regular 220/440cc cartridges for colors that are not so often used. In-end detection function to prevent misprints without ink is also available.The bulk ink system is an eco-friendly ink system that produces less waste while achieving continuous printing. Head height can be adjusted to either 2mm or 3mm according to the media thickness. For the aqueous ink model, height head adjustment of either 4mm or 5mm* is available. *adjustment by technician is required. Securely holds media in place for more accurate and secure media feed. This works especially well for long prints. Drying speed can be improved with the use of a postheater. 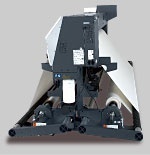 The takeup reel can be used even when printing at high speed, improving efficiency and work flow. Exhaust-fans attached to the front and exhaust-ducts on the back help removing fumes effectively. A curtain attached to the front of the machine reduces the spread of printing exhaust and help removing fumes effectively. The feeding and take-up device can securely feed heavy media with a maximum width of 2.6m (103"). For less wide and lighter media, a standard take-up device is also available.